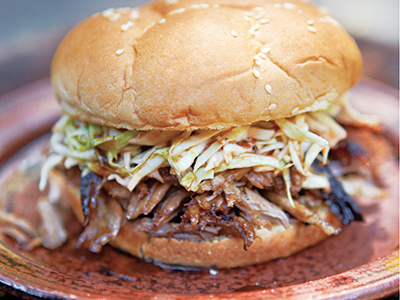 This pulled pork with homemade barbecue and dipping sauce will impress your guests. From Williams-Sonoma Grill Master. 1. At least 1 hour before you plan to begin cooking, remove the pork from the refrigerator. In a jar, combine the apple cider, sugar, salt, Worcestershire sauce, hot-pepper sauce, and 1⁄2 cup warm water. Cover and shake the jar vigorously until the sugar and salt have dissolved. Load a marinade injector with the apple cider mixture, and inject the mixture into the pork in several places. Season the pork on all sides with salt and pepper. 2. Prepare a smoker or a charcoal or gas grill for smoking over low heat; the temperature of the grill should be 200º-250ºF. If using charcoal, bank the lit coals on either side of the grill bed, leaving a strip in the center without heat. Place a drip pan in the center strip and fill the pan with water. Add a handful of the wood chips to the fire just before grilling. If using gas, fill the smoker box with wood chips, then preheat the grill. Turn off 1 or more of the burners to create a cooler zone. Brush and oil the grill grate. 3. Place the pork on the grill over the indirect-heat area, cover, and smoke for a total of about 4 hours, adding additional wood chips every 30 minutes or so and more coals as needed if using charcoal. 4. After 4 hours, remove the pork and double wrap it in aluminum foil. You can put it back on the grill and cook it slowly for another 6 hours (I don’t recommend this if you’re using charcoal), or you can place it in a roasting pan in a 250ºF oven for an additional 6 hours. The pork is ready when you can easily slide out the bone with a pair of tongs. 5. Transfer the pork to a cutting board and let cool for about 30 minutes. Remove any fat cap. Using 2 forks, pull and shred all the meat. Sprinkle a little salt over the pork and add about 1⁄2 cup BBQ sauce and toss to blend. Pile the meat on a platter and put out the buns, remaining BBQ sauce, and the Lexington-style dip. Then dig in. In a saucepan over medium heat, combine the ketchup, mustard, vinegar, sugar, broth, a pinch of salt, and 2 teaspoons pepper and bring to a simmer, stirring to dissolve the sugar. For a Southwest-style sauce, stir in the chiles and cumin. Simmer for 5 minutes for a relatively thin sauce or for 10–15 minutes for a thick sauce. Taste and adjust the seasoning with salt. Use right away, or let cool and store in an airtight container in the refrigerator for up to 1 month. 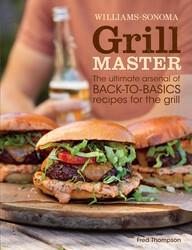 The ultimate arsenal of back-to-basics recipes for the grill, featuring popular dishes that are delicious and easy-to-prepare.Want to know how to make the most crave-worthy burger, sear the juiciest steak, grill BBQ chicken or salmon fillets to perfection, or smoke a pork shoulder so succulent it makes people weak in the knees? You’ll find the secrets to grilling these classic recipes and dozens more in this essential guide to the subject.